Liquids terminaling and logistics provider Moda Midstream announced it has successfully commissioned upgrades to Berth 2A at the Moda Ingleside Energy Center (MIEC) in Ingleside, Texas, to enable loading of very large crude carriers (VLCCs).Moda developed these upgrades to provide existing and potential customers the ability to safely and cost-effectively load VLCCs at rates of up to 80,000 barrels per hour.“Today we are loading our fourth VLCC at MIEC since late December,” said Moda President and CEO Bo McCall. “With today’s commissioning of our upgrades to Berth 2A, we now have the U.S. The provider of floating production services to the oil and gas industry BW Offshore is pleased to announce the sail away of the FPSO BW Adolo. The vessel has left anchorage in Singapore and is currently in transit to the Tortue field offshore Gabon. BW Adolo is expected to arrive at the field in August 2018. "We are firmly on track for first oil later this year", said Carl K. Arnet, the CEO of BW Offshore. The BW Adolo has an oil storage capacity of 1,350,000 barrels and a production capacity of 40,000 barrels of oil per day. Premier Oil’s Catcher project remains on pace to achieve first oil before the end of this year with the arrival and hook up of the Floating Production Storage and Offloading (FPSO) vessel BW Catcher last week in the U.K. North Sea. BW Catcher arrived at the Catcher field on October 18, and the hook up of the Submerged Turret Production (STP) buoy mooring system was completed on October 19 with the vessel completing a rotation test around the buoy on October 20, Premier Oil said. Final pull-in of the risers and umbilicals is underway, and commissioning activities have commenced in parallel. BW Offshore’s Floating, Production, Storage and Offloading vessel (FPSO) BW Catcher has left deep water anchorage off the Keppel Shipyard in Singapore and is currently in transit on a 45-day journey to the Catcher field in the central North Sea where it will go to work for Premier Oil. 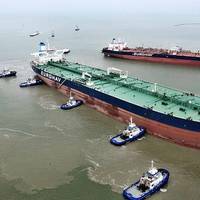 The FPSO is expected to reach U.K. waters early in the fourth quarter, depending on prevailing weather conditions. Upon its arrival, BW Catcher will commence a seven-year fixed term contract, with extension options of up to 18 years, with Premier Oil. Carl K. Arnet, CEO of BW Offshore, said, “The BW Catcher has been completed on time and within budget, and we are especially pleased with the good HSE performance during the construction project. 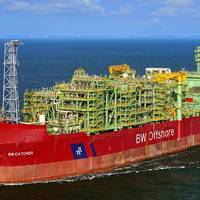 BW Offshore, a leading global provider of floating production services to the oil and gas industry, announced the sail away of the FPSO BW Catcher. The vessel has left Keppel Shipyard in Singapore and is currently in transit to the Catcher field in the central North Sea. BW Catcher is expected to reach UK waters early in the fourth quarter, depending on prevailing weather conditions. Upon its arrival, BW Catcher will commence a seven-year fixed term contract, with extension options of up to 18 years, with Premier Oil. Keppel Shipyard Ltd (Keppel Shipyard), is on track to deliver a Floating Production Storage and Offloading (FPSO) vessel to BW Catcher Limited, a wholly-owned subsidiary of BW Offshore. When completed BW Catcher will be on a 7-year fixed term and 18 years of options contract with Premier Oil and will be deployed to the Catcher Field located in Central North Sea, UK. Keppel Shipyard's work scope on the FPSO include the installation and integration of topside modules. BW Catcher is scheduled for sailaway from the shipyard in the next few months and is on track to achieve its first oil in 2017. "Having worked together on 11 other projects previously, Keppel has proven to be a reliable partner," said Carl Arnet, CEO, BW Offshore. On Saturday (February 4), the floating production, storage and offloading vessel (FPSO) P-66 left the Brasfels shipyard in Angra dos Reis, Rio de Janeiro. It is now heading to the Lula Sul module in the Lula field, Santos Basin pre-salt, where it is expected to arrive in the next few days. The production system will come online after the vessel has been moored and the first production well has been connected. 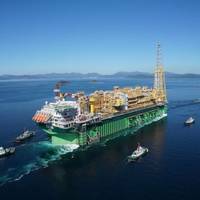 P-66 is the Lula Consortium’s first FPSO to be deployed in the Santos Basin pre-salt. It was assembled at the Brasfels shipyard in Angra dos Reis, where the equipment and systems were also tested. The FPSO will separate the oil from the gas and water during the production process, storing it in tanks, and finally transferring it into oil tankers, which will then transport it. In February, a second floating production, storage, and offloading (FPSO)* unit deployed by NYK for the BM-S-11 consortium through a joint venture company started oil production in a pre-salt area off Brazil. This FPSO unit, FPSO Cidade de Marica, is owned by a shareholder consortium comprising SBM Offshore N.V. (Netherlands), Queiroz Galvão Óleo e Gás S.A. (Brazil), and a joint venture company between NYK (48.72 percent; head office: Chiyoda-ku, Tokyo; president: Tadaaki Naito) and the Mitsubishi Corporation (51.28 percent; head office: Chiyoda-ku, Tokyo; president & CEO: Ken Kobayashi). Kvichak’s Rapid Response Skimmers (RRS) are perhaps best known for their use by the U.S. Navy, but the design of these robust and well-designed units has evolved over time and today boasts placement in virtually every major spill organization. When, just this past October, Kvichak Marine won a U.S. Navy contract for 12 30-foot Rapid Response Skimmers (RRS) for delivery over the next 18 months, with options for up to 30 additional skimmers to be delivered through 2019, that wasn’t necessarily earthshaking news. MODEC, Inc., Mitsui & Co., Ltd. Mitsui O.S.K. Lines, Ltd., and Marubeni Corporation have agreed that Mitsui, MOL and Marubeni will invest in a long-term charter business (“the Project”) currently promoted by MODEC for the purpose of providing a floating production, storage, and offloading system (“the FPSO”) for use in the Tartaruga Verde and Tartaruga Mestiça oil fields off the coast of Brazil. The above four companies have entered into related agreements today. Based on these agreements, Mitsui, MOL and Marubeni will invest in Tartaruga MV29 B.V.
Mitsui Engineering & Shipbuilding Co., Ltd. (MES) delivered the hull of a floating production, storage and offloading unit (FPSO) for MODEC, Inc. 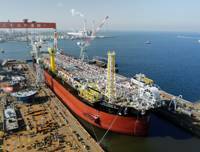 The FPSO hull sailed out from MES’ Chiba Shipyard on February 27, 2015. 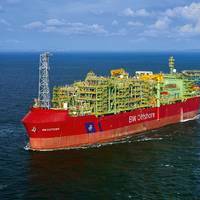 The FPSO will be chartered to a consortium formed by Petrobras (45%), BG Group (30%) and Repsol Sinopec Brasil S.A. (25%) after topside integration and commissioning work by MODEC. This is MES’ second FPSO hull, following Kerr-Mcggy Global Producer III delivered in 2000. Wilson Sons Estaleiros Ltda, has contracted with Braizilian subsidiary shipyard Oceanpact for the construction of four Oil Spill Recovery Vessels (OSRVs), with recovered oil storage capacity of 1,050 m³, a length of 67 meters, and a beam of 14 meters. Wilson inform that for the construction of the four vessels, Oceanpact will pay approximately BRL 333 million (three hundred and thirty three million brazilian reais). 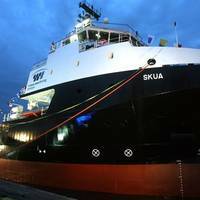 The vessels, which are scheduled to be delivered by 2016, will be built in Wilson Sons' Shipyard complex, in Guarujá (SP). MODEC, Inc., Mitsui & Co., Ltd., Mitsui O.S.K. Lines, Ltd. (MOL) and Marubeni Corporation have agreed that Mitsui, MOL and Marubeni will invest in a long-term charter business currently promoted by MODEC for the purpose of providing a floating production, storage and offloading system (FPSO) for use in the Carioca area of a pre-salt oil field off the coast of Brazil. The four companies have entered into definitive agreements today. Based on these agreements, Mitsui, MOL and Marubeni will invest in Carioca MV27 B.V., a Dutch company established by MODEC, and the Companies will proceed with the Project jointly. MV27 has signed a long-term chartering agreement for the deployment of the vessel by the BM-S-9 Consortium – Petrobras (45%), BG Group (30%) and Repsol Sinopec Brasil S.A. (25%). Aegean Marine Petroleum Network Inc. plans expansion in Barcelona, contracts with Meroil for onshore fuel oil storage. Aegean Marine Petroleum Network has signed an agreement to secure onshore fuel oil storage capacity in Port of Barcelona and plans to start supply operations by the end of Q1 2013. The port of Barcelona serves as a key transportation hub located along major seaborne trade routes, totalling approximately 10,000 transits per year and generating approximately 1.2 million metric tons of annual marine fuel sales volumes. The port, which also benefits from extensive cruise passenger travel, is currently undergoing a modernization and expansion plan headed by the Barcelona Port Authority that is expected to substantially increase the port's capacity upon completion in 2014. 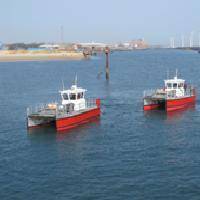 Alnmaritec Limited, which is recognised as one of the UK's leading specialist boat builders, has recently delivered two new oil pollution control boats for operation in Asia. The new ‘Wave Skimmer’ class boats were delivered by Alnmaritec earlier this year to Elastec American Marine who also supplied all of the oil recovery and storage equipments on board. These boats follow on from the successful Wave Provider class boat that was delivered by Alnmaritec to Elastec (a major manufacturer of oil spill equipment) in 2010, also for operations in Asia. Two New England shipyards, one in Massachusetts and one in Rhode Island, will pay penalties to settle claims by the U.S. Environmental Protection Agency that they violated federal environmental laws. Rose’s Oil Service, a shipyard and fuel oil distributor in Gloucester, Mass., will pay $130,000 to resolve claims it violated federal water and oil pollution prevention laws. Under the settlement agreement between Rose’s Oil and EPA’s New England office, EPA alleges the company discharged pressure wash water and stormwater without authorization under the Clean Water Act. Rose’s Oil also failed to prepare a Facility Response Plan and an adequate Spill Prevention, Control, and Countermeasure Plan in violation of federal oil pollution regulations. OPE, Inc. has awarded WorleyParsons SEA Engineering the detailed design of the SSP-320 Hull. The Satellite Services Platform (SSP) is a patented spherical-shaped floating vessel with a unique center column that provides measurable advantages over ship-shaped vessels and traditional platforms. The SSP project engineering team is expected to deliver the specified material and fabrication packages in the third quarter of 2008 to obtain accurate construction quotes and shipyard availability. This model has a 1,250,000 barrel oil storage capacity and 80,000 bopd production capacity.